All that being said, you can probably guess that I really loved Still Life. Still Life introduces readers to the community of Three Pines, just outside of Montreal. When Jane Neal, an elderly woman in the village, is found dead in the woods, Chief Inspector Armand Gamache and his team are called in to discover exactly what happened and who is to blame. Their investigation leads them to a group of local artists, a few eccentric residents, and a few relatives and neighbors harboring a great deal of bitterness. Meanwhile, Gamache and his right-hand man, Jean Guy Beauvoir, also have to deal with Yvette Nichol, a young agent with entirely too much confidence and not near enough tact on her first homicide case with Inspector Gamache. Where do I even start with all the things I enjoyed about Still Life? First and foremost, Three Pines is described in a way that makes me imagine a quaint village full of wonderful people and adorable shops. With every chapter, I found myself imagining a stroll through the town, stopping to browse the shelves in Myrna’s bookstore or enjoy a croissant at the bistro. 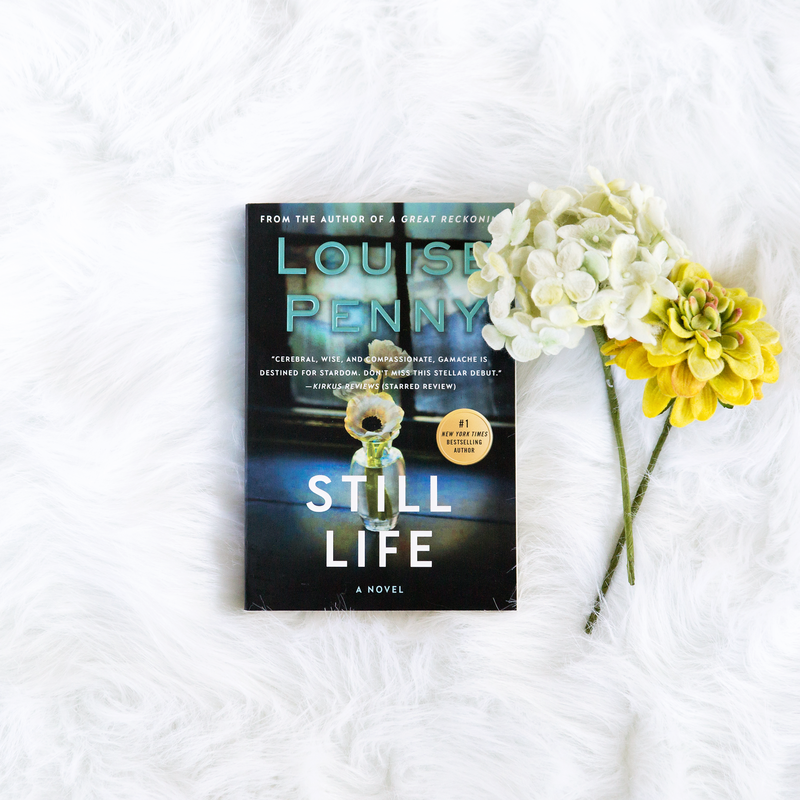 Louise Penny has done something very few other writers have done for me–she made me fall in love with the setting of a series of books in the very first book. She also did something else that very few other writers have done for me. She created a vivid cast of characters and developed them all in a way that left me invested in them all, despite the fact that there were a lot of them. Each character in the book has a distinct personality, and MOST of the characters were ones I truly cared about by the end. I knew that I would be sincerely disappointed when I learned the identity of the murderer, regardless of who that person was, because of the emotional attachment to each of them that Penny made me form, and I am incredibly excited to continue following almost all of their journeys in the books to come. In addition, the characters were all insightful and provided enlightening comments on life and human nature throughout the book…but especially Armand Gamache. Oh, Gamache. How I love you. His perceptive and wise nature made me want to track him down and tell him all my secrets and thoughts about life. His relationship with Beauvoir was the perfect balance of almost fatherly love and professional respect, and his evaluation of the people with whom he interacted was spot-on. He’s basically adorable, and I want him to be a real person. Last, but not least, I loved that Penny made every detail and every suspicion have an explanation. There were several red herrings in the book that made the ending an almost complete surprise (although I did have some suspicions about the murderer that proved correct), but all of those red herrings had explanations that made complete sense, and all the little details of the story that seemed random at the time proved to be very deliberate. Still Life was the perfect balance of mystery and heart, and it called to mind comparisons to Lillian Jackson Braun’s The Cat Who… series (My love for James Qwilleran will be difficult to beat, Armand Gamache!). If you have read and loved those books as I have, then you should definitely give Louise Penny’s books a chance. I can’t wait to read the second book with my “Penny Pushers” next month! Posted in FictionTagged Armand Gamache Series, book review, Louise Penny, mystery book review, Still Life, Three PinesBookmark the permalink. That would be awesome! We have so much fun discussing the book (and tons of random stuff as well) while we read! Awesome! We would love to have you!